The Ridgepoint Winery is a small 20 acre property in the Niagara Escarpment dedicated to producing premium and ultra premium VQA wines for all guests to enjoy. This Niagara Winery was the first vineyard in Ontario to commercially bottle Nebbiolo, the renowned Barolo wines from Italy. The acre 18 vineyard consists of Chardonnay, Riesling, Cabernet Sauvignon, Cabernet Franc, Merlot and Pinot Noir grape varietals. The first wines distributed to the public was in 2003, and consisted of whites and “quaffing reds”. The new restaurant located on site is the Scarsellones at Ridgepoint. 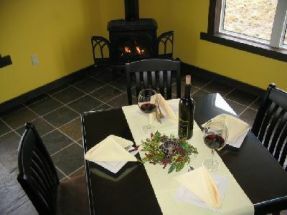 This unique winery dining experience offers light and casual dining and hosts some of the special wine events held here. Enjoy the ultra premium wines produced at the estate winery as they are paired with magnificent Italian dishes. Reservations are recommended, contact the winery for more information.